Preheat oven to 375 degrees F. Lightly grease a large baking pan. Place a small (16-ounce) oven safe bowl in the center of baking sheet and set aside. Add melted butter to a separate shallow bowl along with garlic powder, oregano and most of the parmesan cheese (reserve some to sprinkle on top after baked). Cut pizza dough into 12 equal pieces. Roll the balls in the butter mixture until well coated. Place dough balls on baking sheet around bowl to make a ring, and top with remaining butter mixture. Remove bowl from center and bake pizza dough for 30 minutes. Remove from oven and top each ball with shredded mozzarella cheese and pepperoni. Place back in the oven for an additional 10-15 minutes. In a sauce pan on the stove, combine tomato sauce with ricotta cheese. Cook at medium heat and stir until smooth. Remove pizza bread from oven and sprinkle with remaining parmesan cheese. Pour tomato sauce with ricotta into the small bowl and place back in the center of the ring to serve. 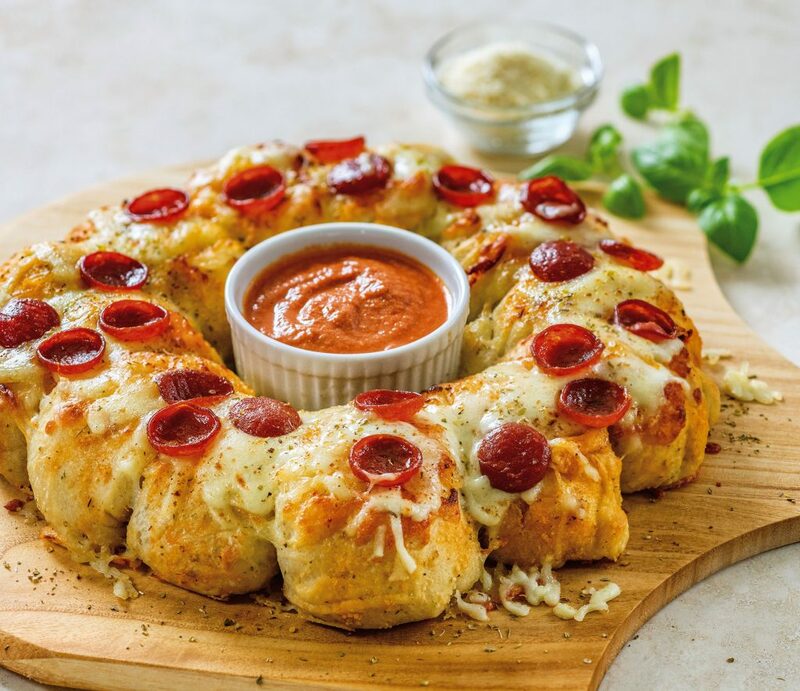 Pull apart the pizza balls and dip into sauce.